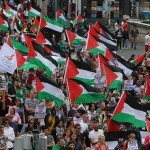 On Saturday 9th August 2014, over 10,000 people march from the Spire in Dublin to the Israeli Embassy in an incredible show of opposition to the Israeli attacks on Gaza and in solidarity with the Palestinian people. Their message was simple, “it’s time for freedom and justice for Palestine”. When the huge crowd reached its destination, they were address by several speakers. The videos of most of these speeches are below. Trevor Hogan, former Irish rugby international and member of Gaza Action Ireland. Ronit Lentin, Jewish-Israeli Professor in Trinity College Dublin and member of Academics for Palestine.